I don't know HOW MANY time's I've called that out at the end of class! 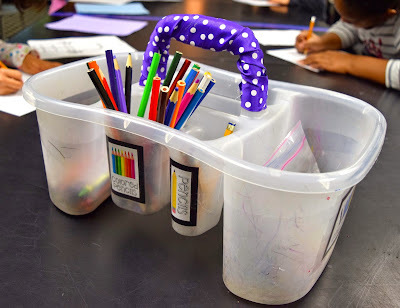 On the first day of art class, I went over how to organize the table buckets with every single one of my classes, and for a while they stayed pretty organized. Then... CHAOS. 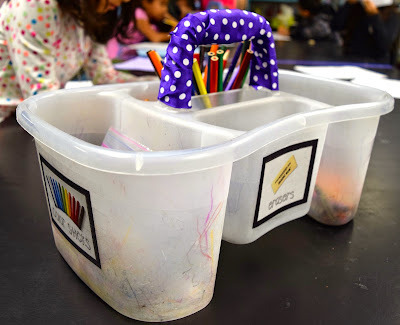 Well... as chaotic as messy buckets full of art supplies can get. I have no idea why I didn't think of this sooner. 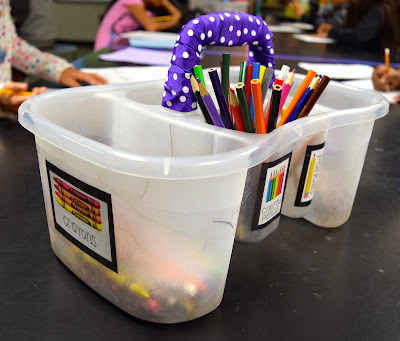 Everything else in my classroom is super organized - so the fact that it never dawned on me to put labels on my table buckets is madness. So on our teacher workday right after winter break I spent some time printing, mounting, and taping these labels onto my buckets. And I have to say - ever since they have stayed extremely organized! Each bucket now has a space for colored pencils, pencils, erasers, color sticks, and crayons. On each label I also included a visual to help my younger students and ESL students figure out what goes where. 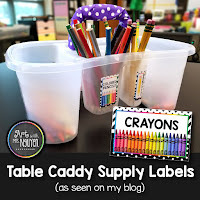 If you have this particular type of bucket, feel free to download these labels for free from my TPT store! I get so worked up about my buckets! I have a strict pencil and sharpie only rule in mine. But I love it when I'll ask someone to put away an oil pastel or crayon and as I am standing there watching they always try to sneak it into the bucket, nothing gets past me! Where are your buckets from? Walmart? an Art catalog? I know I am commenting on an old post, but hopefully I'll hear back from you! my email is: cassiemae82@yahoo.com currently my little table caddys I feel are to small! I got them from Walmart! They were near the laundry/bathroom caddies. I just tried looking for it online but I can't seem to find it. Maybe it's in-store only?